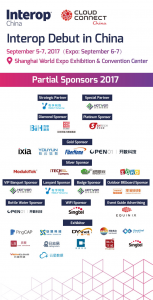 Shanghai, China, July 21, 2017 /ChinaNewswire.com/ - Organized by UBM China, Interop & Cloud Connect China 2017 is going to take place at Shanghai World Expo Exhibition & Convention Center on September 5-7, 2017. This year, the overall scale and the quality of the event will be superior to the previous one thanks to the debut of Interop in Shanghai. Cloud computing service and solution providers and networking enterprises will congregate to meet IT leaders like CIOs and CTOs from end users in finance, e-commerce, FMCG, retail, education, manufacture, rail transit, national defense, etc. A new round of discussion over cloud computing and networking' technical innovation and practical application is definitely to be brought by eminent speakers in China and foreign countries. — Haiming Yang, Chief Architect, JD.com.